Our Department of Surgery is richly steeped in a tradition of academic successes and innovative research, traversing across six fully affiliated teaching hospitals and a continuously expanding number of communityaffiliates. With over 400 faculty members and scientists, 200 fellows, 250 residents, and 225 medical students in its domain each year, the Department is certainly no stranger to intellect and talent. However, no institution would reach such unparalleled excellence without the guidance of an exceptional leader. Dr. James T. Rutka successfully completed the external review of his five-year term as Chair of the Department of Surgery in October 2015. The process was led by Professors John Kortbeek (Chair of Surgery, University of Calgary & Alberta Health Services) and Albert Pellegrini (Surgery, University of Washington). It consisted of in-depth reviews of Departmental education, research, internal and external relationships, organizational and financial structure, and long-term strategies. The reviewers examined the 2010 Review findings and believed that the Department exceeded the implementation of its recommendations. The reviewers noted that the Department had prioritized development of both undergraduate and postgraduate educational activities. The establishment of the Surgical Exploration and Discovery (SEAD) course and a refined clerkship curriculum were some firsts for the undergraduate program, while the residents began an annual PGY1 Prep Camp at the Surgical Skills Center. The resident program was also commended for its leadership in competency-based education and its preparation to easily adopt the RCPSC’s competency-by-design program as it rolls out over the next few years. Praise was given for positive faculty-resident relationships and ongoing engaged evaluations. Dr. Rutka was commended for having created a culture that was supportive and conducive to learning at all levels. The Review examined the scope and quality of the Department’s research activity, noting its $40MN annual funding and 7000 peer-reviewed publications over a fiveyear span. With Dr. Rutka’s CV boasting over 400 publications in prominent journals and his active engagement in neurosurgical research, the Reviewers felt that he was an outstanding leader by example in this arena. 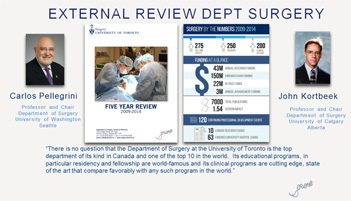 From an educational standpoint, the Review was impressed by several notable ‘firsts’ for the Department: Creation of a Faculty Development Day, implementation of Quality Improvement and Best Practices initiatives, preparation of Late Career Transition Guidelines, the introduction of a Global Surgery academic role and ongoing support for international efforts, harmonization of Departmental academic salaries, establishment of a Brain Tumour Bank initiative, creation of a resident course in Practice/Financial Management, the hiring of a Strategic Planning Coordinator and a Communications Coordinator, and a faculty mentoring program. Based on Review feedback and his own vision, Dr. Rutka hopes to devote the next five years to fundraising efforts, particularly to support harmony across hospital boundaries for clinical programs. This would ultimately result in improved patient care delivery and a decreased cost per unit of utilization through an increased standardization of practice across the healthcare system. This effort has already matured in the area of Trauma, but the unified implementation for all units is expected in years to come. Furthermore, collaboration will be promoted in data sharing, standardized metrics, and quality management. Dr. Rutka also wishes to concentrate on transitions; the transition from medical school to residency, from residency to fellowship, fellowship to workforce, and the consideration of how and when to gracefully exit the workforce. Initiatives will include increased mentorship, coaching seminars, and guidelines. A new Strategic Plan will fully encompass Dr. Rutka’s visions of improvement and maintenance of excellence, and he will draw upon active faculty and learner engagement to design these priorities. Overall, the reviewers were very pleased to find such positive faculty morale within the Department and the unanimous support of Dr. Rutka’s collaborative leadership style. Learners and faculty alike believed he was a strong advocate for their interests. The Review praised both Dr. Rutka and the Department on the accomplishment of many firsts as well as its ongoing commitment to academic excellence, and had no doubt that the next five years would give way to many more impressive activities. Please join me in congratulating Dr. Rutka on his exemplary leadership.